The Accordion of History? The Squeezebox of Obsolescence, more like. You are on a quay just outside Bantry, on the southwest coast of Ireland. 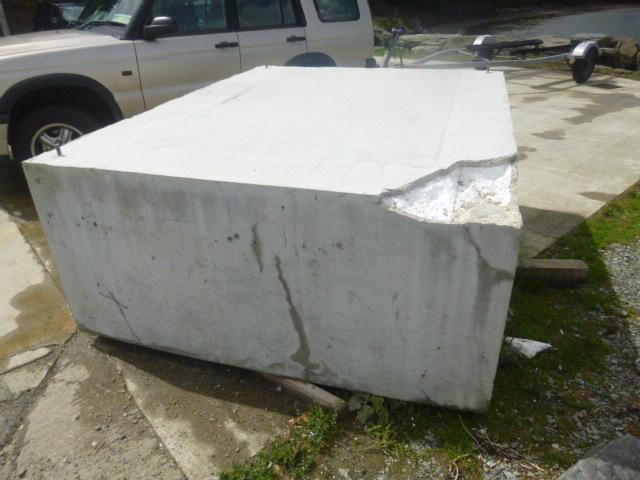 In post-building boom Ireland, there is something familiar about the way this block has been abandoned, askew on the concrete, dumped either because it is damaged on the corner or because the construction firm went bust. The little slips of wood underneath, originally to help a lifting machine slide underneath, have softened and rotted to pulp. So far, so recession. You take a closer look. Readers of Slab will be familiar with images of the secret polymer innards of apparently substantial architectural objets. But this block of science friction strikes you as particularly alien. You are contemplating the styrofoam hyperobject, an entity that will outlive you, that will out-exist you, on a timescale that has no place for the things that we usually call objects. Why are you thinking like this? On the way to Bantry, you saw this. 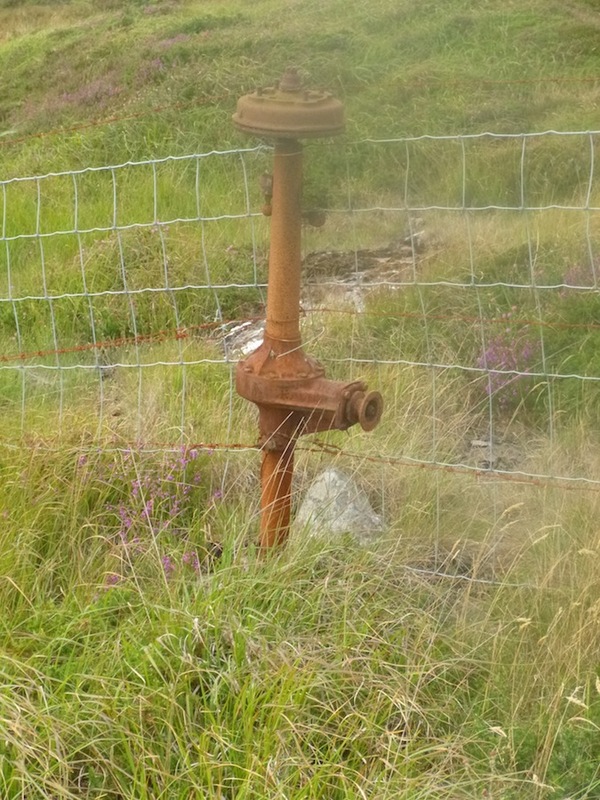 A farmer has used an old axle as a fencepost to enclose sheep on this particular windswept outcrop of turf and heather. The incongruity is apparent, because (let’s spell this out) it is a piece of modern engineering that has been repurposed in a natural, non-industrial environment. And perhaps you are pleased to sense the axle’s decay, its chemical disintegration in the face of weather, vegetation, soil and time. 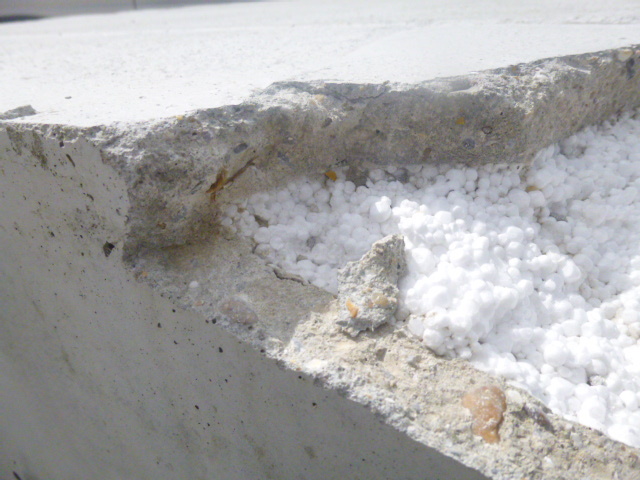 The quayside block may lose its blockiness with time, but the styrofoam will never change, and that’s uncanny. ‘Incongruous’ doesn’t even start to cover it. The axle is almost quaint. In the grand historical sweep of things, ‘antique’ machinery has been integrated into a nostalgic vision with striking speed. The defunct maritime technology in a fishing port pub (brass compasses, oil lamps), the skeletal remains of mass-produced iron farm machinery in an Irish pub, and the chipped enamel signs for long-forgotten brands in a German bar – these are all barely a century old. The rush to assign machinery to the trash heap of memory even results, for God’s sake, in perfectly functional bikes being pimped out to sell the cornucopia of fruit and vegetables of the common supermarket, a display that itself is strangely subject to immediate decay yet is in denial of all historical conceptions of time, place, culture, climate, transport and cuisine. In other words, modern agriculture is another hyperobject, festooned with the disjecta of an outmoded transport infrastructure, which invisiblizes the world-destroying hyperobject of mass-transportation-refrigeration-genetic-modification-industrialization-herbicide-pesticide-carbonization-suburbanization. Not to mention dummification. Of course, it’s easy to ignore how modern old-fashioned modernity really was. The bike was a revolutionary technology that changed the shapes of cities, patterns of labour, gender relations, rural spheres of contact, and much more. Back in West Cork, the farmer is penning in his sheep on the uplands, once inhabited and farmed by humans on the edge of starvation. It’s worth remembering how new the potato was, the key crop that sustained and then failed this population – it came to Europe a mere 200 years before. Then comes a truly modern, continent-wide event, the Napoleonic Wars, and the land is cleared of surviving humans to make way for sheep, because the price of wool has been driven up by the conflict. And all of this long before the invention of the bicycle. 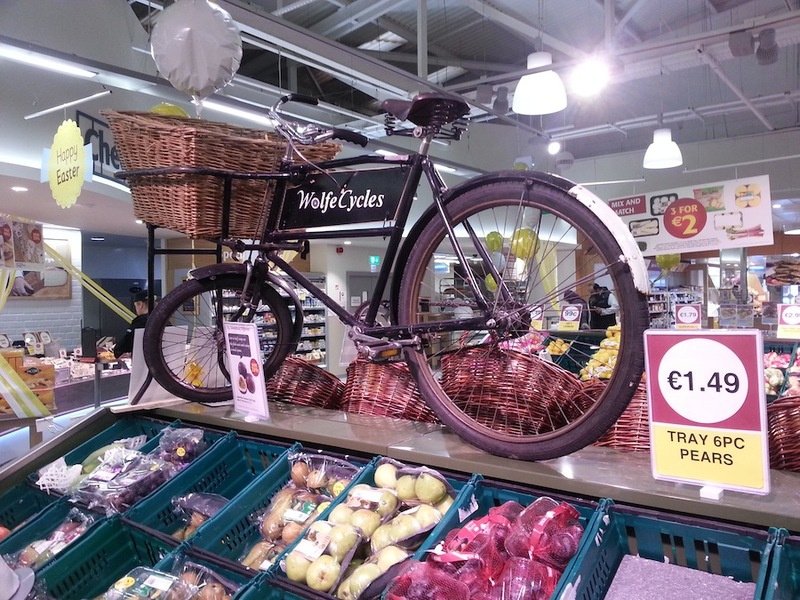 What other staples of the vision of traditional Irish rural life are in fact modern imports? Tea. Sugar. Corn. Tobacco. St Patrick’s Day. 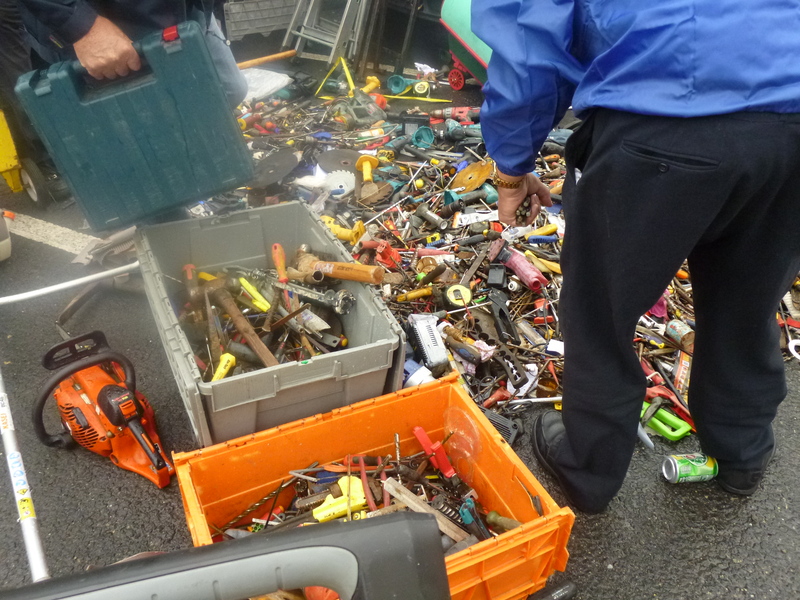 A few miles up the road from Bantry, there is a fair in Kenmare, where you find more evidence of post-building-boom junk, this time in the form of tools of bankrupt and unemployed builders, dumped on the tarmac for the patient browser who knows what he or she is looking for. 20 or 30 years ago, you might have come across a jumbled box of screws, bolts and hinges, but the pace of obsolescence has increased even since then. Tools and the things they make are in an ever-faster race towards a vanishing point of obsolescence, each trying to become junk before the other. The dislocation of it all dizzies the holidaymaker. Before obsolescence was its opposite – some kind of combination of immanence and transcendence achieved by feats of heroic prehistoric engineering. 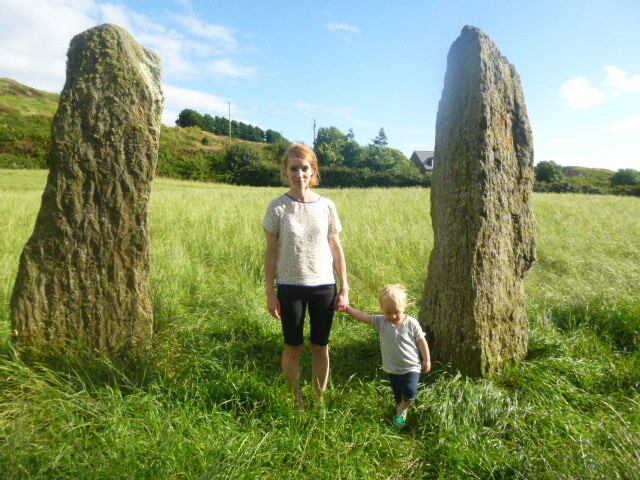 Two great 5000-year-old megaliths jut from the earth in a field just off the road, and their slow weathering, their gradual death, and their inarguable meaningfulness (though what it is that they say is obscure) make 3000 BCE seem like it was a very long time ago.